These are two great watercolour brushes that I've had for many years. The bigger one (1, 2 and 3) is a Da Vinci Maestro No. 12 Series 10, Kolinsky sable, which I use only for transparent watercolour (e.g. Ballinspittle, below). The smaller one (4) is a Talens No. 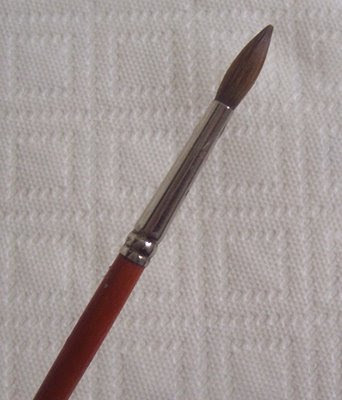 10 Series 110 pure red sable which I use mostly for gouache (e.g. 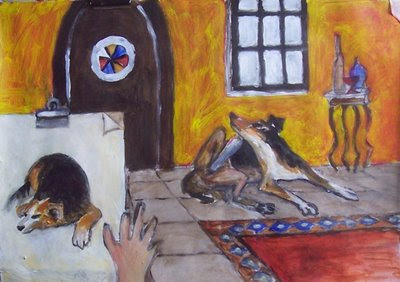 the Dog study for an OCA course, below). In fact I use the Talens brush a good deal more than the Da Vinci because I use gouache very often, and pure watercolour quite rarely. 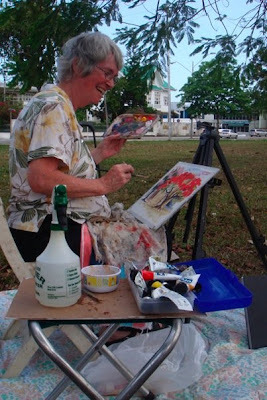 I bought the Talens at Deltex in Trinidad at least ten years ago for about US$20 and use it so much that the point has become somewhat worn. I bought the Da Vinci in London in 2002 for about US $100. They were both expensive but they've both earned their keep. I did the testing routine with water in both cases when I was buying them. That is, I asked the assistant in the store for water to test the spring and the point. To test the point, wet the brush in the water, then take it out and give it a quick shake with a flick of the wrist. A first-rate brush will come to an extremely fine point, as in photo 3. To test the spring, draw the wet brush across the back of the hand to bend the hairs (photo 2). 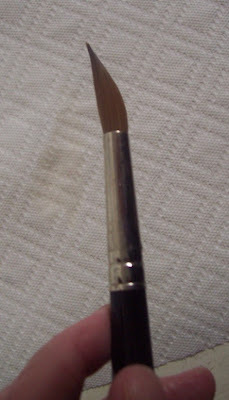 When you remove it the body of the brush should spring back in line with the handle. 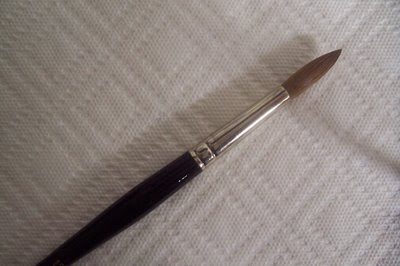 The photo shows that the spring in this brush is not perfect, but it's pretty good and has performed well. These are the only brushes I need for watercolour and gouache. I wouldn't ever use either of them for acrylic which is very hard on brushes. 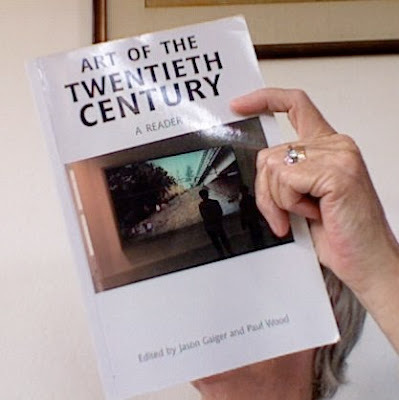 Art of the Twentieth Century: A Reader, edited by Jason Gaiger and Paul Wood. "Art of the Twentieth Century: A Reader is a collection of writings by critics and art historians on the major themes and debates that have animated the practice and interpretation of art over the last hundred years. [. . . ] Key themes and topics include: canonical modernism and the questioning of the principles of modernism; the role of the avant-garde; photography in art; the pivotal moment of the late 1960s; the shift from modernism to postmodernism; gender and the performance of identity; and the globalisation of art. Art of the Twentieth Century: A Reader is a free-standing volume that will be of interest to the general reader and student alike. It is also a companion volume to the Open University art-history course of the same name. Jason Gaiger and Paul Wood are both lecturers in art history at the Open University." I've only read a couple of the essays so far, so this is a first impression rather than a review, but it seems like a worthwhile purchase. A point in its favour is that the essays are directly about visual art topics, and the topics covered would not generally be found in art history textbooks, or at least not in as much depth. This makes the book more relevant to the visual artist than "cultural studies" texts which tend to be more about philosophy, aesthetics and political theory. Even so, I have a level of caution about writings by critics and art historians, who are often not themselves artists and who may or may not have a sufficient grasp of the practical issues that affect the making of art. But I'll be keeping an open mind and am looking forward to reading Clive Bell and Roger Fry, who I've been hearing about for years; also John Szarkowski's extract from his renowned book, The Photographer's Eye, and Jeff Wall's essay, Marks of Indifference. Some of the essays I've read before (e.g. Greenberg's The Pasted Paper Revolution, and Meyer Schapiro's The Nature of Abstract Art). Others such as Craig Owens are new to me, surprises in store, I hope. Only time will tell. I couldn't wait, however, to read Paul Smith's long essay, called "How a Cubist Painting Holds Together", commissioned specially for this book and written in 2002. Would my own analysis of cubism survive this carefully researched academic paper? I read it with trepidation, more than twenty-five pages consisting partly of detailed analysis of specific cubist paintings and partly of explanations of the science of how we see. On reaching the end I hadn't come across anything, fact or opinion, that flat-out contradicted my findings, which was a major relief. In fact, when Smith notes in the last paragraph the cubist painting's "refusal to solidify into a static image, even though it is otherwise coherent", that "coherence" is consistent with my view. 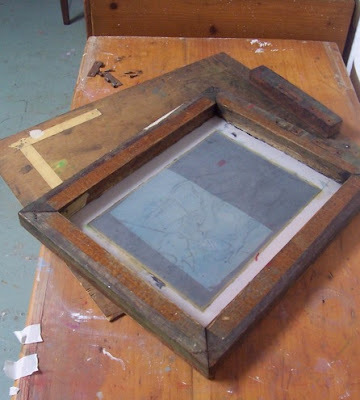 Over the past few days I've been reclaiming an old screen-printing screen. It's at least twenty years old, maybe twenty-five, a remnant of a course I attended many years ago in Arima. I hate throwing things out and that's why I still have this strange object. I can't remember the name of the person who taught the course but she did a great job, teaching all the basic methods and processes including photo stencils. The course occupied one whole day each week over six weeks. We made our own screens on the first day. I think our tutor must have supplied the materials, they are of such good quality and have held up so well. The frame and baseboard are perfectly sound showing no signs of warping or rotting despite years of neglect. The screen itself appears to be in good shape apart from ghost images. I've washed it and dried it and the mesh is taut and looks intact. The hinges were rusty and a pin was missing, so I removed them and will attach new ones next week. Then, with a squeegee and some ink, all I will need is one or two ideas. I'll post the first presentable results here (note the qualifier -- "presentable"). 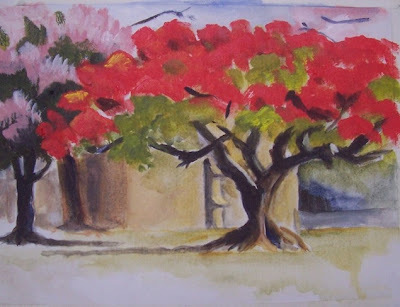 Flamboyant, acrylic sketch, approx 10 x 12"
On Tuesday this week I went with the Plein Air Picassos to the Savannah to paint a spectacular Flamboyant tree in bloom. It was a fun outing. I arrived first at 8:05 am and did a pencil study in my sketchbook before anyone else arrived, and then another. Caroline Mair was next and she did a lovely drawing in black oil paint on the open spread of a small sketchbook, very graphic and striking. Then the others showed up in a bunch. It was a scorching hot day and although I'd carefully chosen a tree with deep shade, I still got some sunburn (trying to avoid getting that greasy sunscreen on my hands) -- but it wasn't too bad and is fading. The two preliminary studies were a help. I went with the second one which had a better composition. Lisa O'Connor says that the tree with the pinkish-mauve flowers on the left is called the Queen of Flowers (Lisa joined the group too). It's a very beautiful tree with flowers growing vigorously upwards. This is the season of flowering trees in Trinidad, first the pink and yellow Pouis a few weeks ago, now the Flamboyants and the Queen of Flowers. 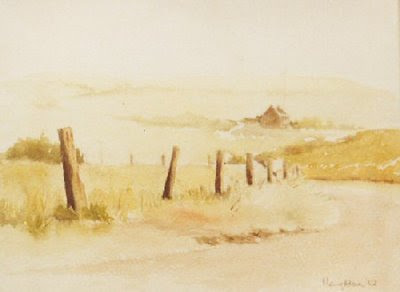 The image above is the acrylic sketch that resulted from the session. The second photo is of me at the scene, taken by Peter Sheppard, showing my outdoor set-up, which is actually quite lightweight though it looks like a lot. I wish people wouldn't do it (take photos of me) but what's done is done and there you have it. And it's rather nice to have this as a reminder of the occasion so I'm not complaining. The only difference for oil is that I use a French easel. It's a lot heavier, more gear to carry, so recently I've been leaning towards acrylic for outdoor work. 1) When acrylic paint dries it becomes more transparent than it looks when first put on. Most sources say it dries darker, which is probably true, but it's also more transparent and therefore streakier. The reason is that the binder or glue that holds the pigment together is opaque or semi-opaque when wet (whitish), but it dries clear. This is merely my own observation, not a scientifically proven fact. 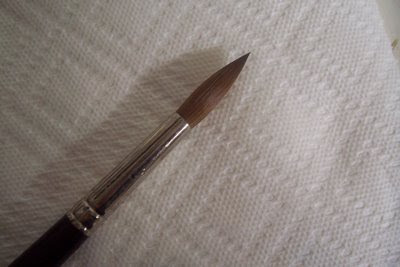 2) A brush ruined by acrylic paint drying and hardening in the bristles makes a good stick for stirring cans of paint.